Sicily is a sun-drenched, palm-fringed island and derives its rich culture from the impressive parade of Mediterranean powers that have ruled its shores for the last two millennia. The glorious monuments are of many epochs, from Greek temples to cathedrals adorned with Arabic-Norman facades. 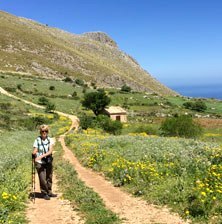 We discover Sicily on walks through the splendid Riserva dello Zingaro, pristine coastal land backed by steep mountains. 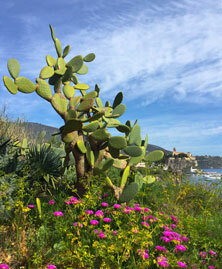 It was Sicily's first nature reserve and is a real oasis of biodiversity. During our walk we find the most isolated and enchanting beaches and enjoy the natural beauty of this protected eco system. The interior of the Madonie Mountains reveals Sicily's deeply rustic culture - tiny mountain villages, farms, shepherds and freshly-made cheeses. From Cefalu we have a magnificent panorama of the turquoise sea and a lovely stretch of sandy beach before moving to the Aeolian Islands, which lead a precarious existence in the buffeted waters off the northern Sicilian coast. 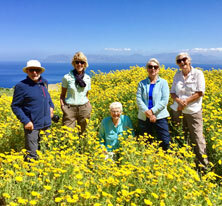 They offer excellent walking with some splendid vantage points over the other islands. They are named after Aeolus, the Greek god who kept the winds he controlled shut tight in one of the islands' many caves. The 2,600 year-old heart of Siracusa, Ortygia, is set on an island. 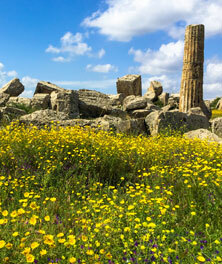 We walk the narrow streets, explore Doric temples and the fabulous Greek, Roman and Christian ruins. The majestic volcano Mount Etna dominates a large part of eastern Sicily and is the highest active volcano in Europe. Our walk takes us above 2000m and together with a local guide we discover this fascinating mountain. Pantalica Gorge is Sicily's greatest necropolis. Along the path through the gorge we discover some of the 5,000 Neolithic tombs, hewn into the canyon walls. On our way to Palermo we stop in Piazza Armerina. Here we visit the vast and sprawling complex of the Villa Romana, once a Roman hunting lodge dating back to 286 and 305 AD. The mosaics are virtually intact and the most breathtaking ones are those of the Roman-African period. On this marvellous island we stay in "the best of both worlds" - the dramatic mountain scenery of the Madonie Mountains in Petralia Sottana and the charming coastal villages like San Vito Lo Capo, the ancient part of Siracusa and the island of Lipari. 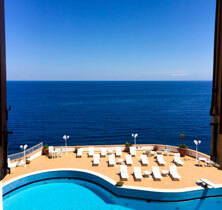 Here we have chosen a variety of beautiful hotels, full of ambience and history. The excellent local cuisine has already a taste of Africa. Mountainous areas produce lamb, goats and characteristic Sicilian cheeses. From the plains and coast, and the rich volcanic soils around Mount Etna, come superb vegetables and sub-tropical fruit. There is also a great variety of fish and very drinkable local red and white wine. Departure dates have been arranged to allow both the "La Dolce Vita" and "Follow the Gourmet Trail" walks to be combined. It was wonderful. I have previously been on at least 6 Walkabout adventures and loved all of them. But in a number of ways this was probably the best. As usual all the accommodations were just the family run ones you would want to stay in but rarely find for yourself. Also as usual the meals were excellent and provided a wide experience of Sicilian food. Sicily is a fascinating island with seemingly endless layers of history and architecture due to numerous invasions over many centuries. For example on the first day where we met in the capital, Palermo, we saw an amazing cathedral built in Norman style and decorated with Arabian art much of which was in gold. Our first three nights were in the north with wonderful views over the ocean. Thereafter we stayed in the mountains, in Lipari in the Aeolian Islands and finally in a converted convent in the amazing city of Syracuse. This wide range of hotels allowed an excellent feeling for the history of the Island and also an excellent range of walks and much to visit on the few free days. The many walks were very varied and all wonderful. We walked around mountains covered with the brightest Alpine coloured flowers I've ever seen. The views were also magnificent. 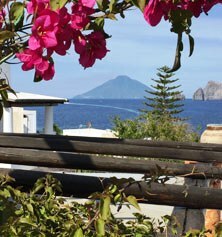 From Lipari we were able to go in boats to see Volcano and climb near to the Stromboli volcano. Every walk introduced us to different aspects of Sicily and we were able to visit Roman arenas and a large Greek theatre. On our last day we visited Hadrian's Villa with extraordinary mosaics. For me the most unexpected experience was climbing up Etna while it was gently spurting out steam, sulfur and dust. Amazing. I came away fitter, amazed by the variation of the countryside and much more aware of the history. The perfect way to spend a holiday with people with similar interests. If I start by telling you that while in Sicily, Bob took about 1900 photos, I don't want you to become alarmed that this letter with photos will cause your server to go into meltdown. We have chosen photos judiciously, and written some words, in the hope that you will be inspired to think about taking a trip to that island or if you already have, to think about returning. And Spring is in our view THE time to be there. The flowers were astonishing. The colours, the abundance, the variety, the vibrancy. In fields, along the roadside, on our walks... We decided, along with our travelling companions, that the flowers would be a major highlight and lasting memory of Sicily. Here is just one of many possible photos to set the scene. But before going there, I'll start in another place that we found interesting and certainly engaging. Just to keep our mini-tradition of visiting Islamic cultures while en route to Europe, we had a couple of days in Kuala Lumpur, and very much enjoyed the experience. It would be our last opportunity to indulge in authentic spicy Asian food before our return to Australia - we did that mainly via a foodies' walking tour in the city's Chinatown and Bangsar/Brickfields area with its strong Indian influences. We had a great guide, an adventurous group, and over a few hours ate and drank what the locals eat every day, and learned something of the history and culture of the city... Read full story. Having just recently returned from your 'La Dolce Vita' walking tour of Sicily with my wife and another couple, I would like to thank you for the most amazing experience. 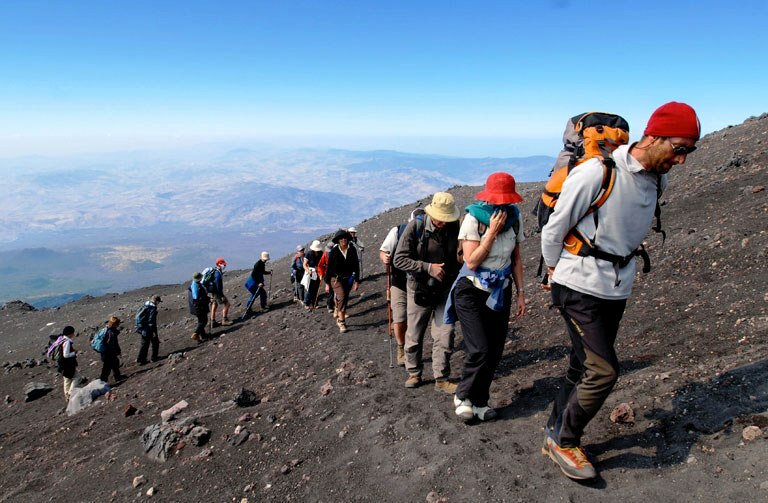 The many walks we did where we experienced breathtaking scenery including mountainous terrain, forests, coastal walks and Mount Etna which was fantastic. The hotels we stayed at were well chosen as they were all different and very comfortable and ideally located. The food we enjoyed at various restaurants was excellent. A feature of your tours that we find to our liking is that you spend three or four nights in each town and you are not packing and unpacking all the time. Our guide Gilles was fantastic, nothing was too much trouble he went out of his way at all times to ensure we were comfortable safe and enjoying ourselves and his personality and humour was enjoyed by all. The combination of all the above and the wonderful couple from interstate that joined us made for a truly unforgettable holiday. This was our second walkabout tour and definitely not our last. Many thanks. As only 4 of us, thank you for going ahead with the tour. It was absolutely FANTASTIC. 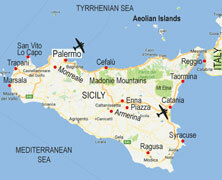 Sicily has so much to offer we would really love to go back. Not all the "strenuous?" walking for this elderly tourist though, but thanks to the enthusiasm, encouragement & help form Papa Gilles the walks were accomplished! The first day just gave us a sample of what was to come - Monreale Cathedral, then ancient ruins at Selinute & Segesta & capped off with a drinks & dinner at our lovely hotel. The next night on the terrace we were nearly blown away with the Sirocco. Mountains & Lunches. Gilles insisted that a tin of tuna & beans was just right for carrying up Cofano & in fact every day we needed a packed lunch. We were horrified & purchased quite unsuitable delicacies like carrots tomatoes cheese ham olives strawberries cherries caponata etc! However by the last few walks, 3 of us were enjoying "tinned" tuna!! Shame. I could rave on for 1000 words, but won't. The Hotels all good but Domus Mariae excellent. The new Renault van (driven expertly by Gilles) caused much amusement as Gilles hadn't work out how the key & the back door worked! Syracuse & walking at Pantalica probably my pick of the tour, but all so wonderful that hard to choose a favourite.